Description: Two yellow bonnets head East through Pine Junction #s 6893 & 6958. Description: Ex-ATSF Yellowbonnets eastbound on the CSX mainline at Pine Junction. 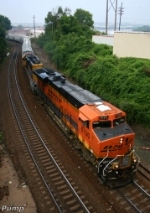 Description: BNSF Northbound Local Freight Train at Carbon Hill, Al. Description: Two veteran forty dash two's working a balast train in the coal fields. Description: Headed through the Gooseneck with an ex-ATSF SD40-2 trailing. Description: Still in clean ATSF paint ready to head back to Longmont with the "Longmont switch"
Description: At BNSF's Mountain Division Headquarters near downtown Denver. Description: I asked around & never got an answer, but this train was seen sitting by the tower at BNSF's yard in Denver with what appears to be coaches from the now-re-defunct American Orient Express. An announcement that the reboot of the luxury train was cancelled came about a week after this shot. Pretty sure I saw them in UP's North Yard a few days prior.